"I think it's absolutely fascinating that a composer of German parents, that lived part of his life in England, that was kind of annexed to Florida, could write this music," exclaims choral director James K. Bass, who leads the Master Chorale of Tampa Bay. Last January the Master Chorale and the Florida Orchestra united to record a live program celebrating composer Frederick Delius. "Well, we were approached, the Florida Orchestra and the Master Chorale of Tampa Bay, by the Delius Trust, which is based in England. And because of the celebration of the 150th year since his birth, they wanted to do something special. And a part of it was this idea of coming back to Florida and having Florida musicians present the music," Bass explains. That idea has just been released as a new recording featuring two rarely heard works by Frederick Delius, Appalachia: Variations on an Old Slave Song with Final Chorus, and the symphonic poem, Sea Drift. Frederick Delius was born in 1862. When he was 22 years old his father sent him to Florida to manage an orange grove, hoping that his son would give up any notions of becoming a composer. "But instead he met [the musician] Thomas Ward, and started studying composition while he lived in a little wood-framed cottage in an orange grove just south of Jacksonville, Florida," Bass explains. Delius was quickly mesmerized by the songs of the plantation workers. "He said that he could hear the songs coming across the river," Bass explains, "And this incredibly romantic ideal of that — he took it at its absolute germ and said this is real music-making. And of course, Appalachia is allegedly based on a tune that he said he heard right there across the St. Johns River." "He begins the piece very kind of hazily and kind of smoky. 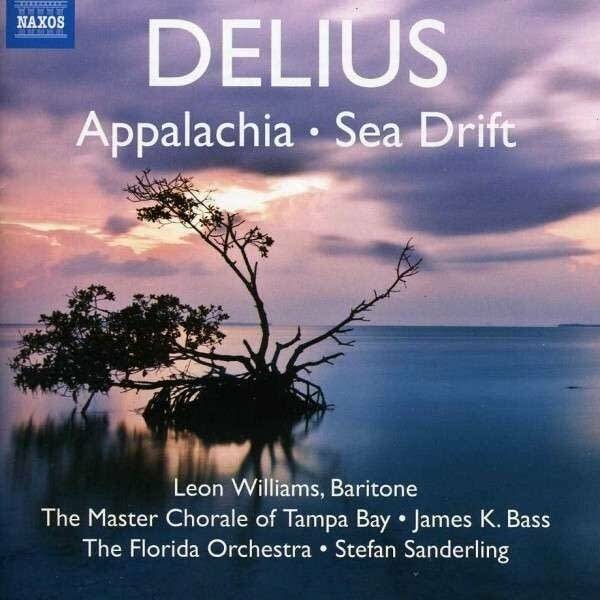 And one of the experts the Delius Trust brought in to give lectures on the work said that there are several times in the piece that he feels he can hear Delius literally composing the scenery of Florida. Just of a hot, humid morning and there's just a little bit of fog or mist on the river, and everything is kind of still. But after he has set the compositional environment, the tune is immediately fleshed out and you hear it pervasively through the work, through the work, through the work. And eventually the work puts words to that tune, which is when Leon Williams and the chorus come in at the end. And so you've been built up to wonder — what does this thing mean? What is it? What is it? And then finally we get words." Sea Drift — a symphonic poem for baritone, chorus and orchestra — is based on a poem by Walt Whitman. It's described as a song of love and death and it, too, features baritone soloist Leon Williams. "Sea Drift is really an amazing work. I had not been familiar with this piece and now it's a piece that will stay with me for the rest of my life. The poetry by itself is just exquisite. It comes from Leaves of Grass. The chorus and the baritone enter within the first two and a half minutes of the piece and then they sing the entire time. And the baritone has an incredible amount of loft and lift in the range. The baritone character in the poem takes on two roles. He's active, he's interacting with the birds — there's a pair of birds that start out in our poem. And then by the end, he's making commentary to all of us on what he has witnessed and what he has felt in this experience with these two birds — as Walt Whitman calls them 'the two guests from Alabama.'" Some say Frederick Delius was at his best when he was dreaming and drifting, fantasizing about musical possibilities. With this new release which marks the composer's 150th anniversary, The Master Chorale of Tampa Bay and the Florida Philharmonic with baritone Leon Williams give us a delightful sample of this British composer's unique voice, which found its roots on a plantation in Jacksonville, Florida.